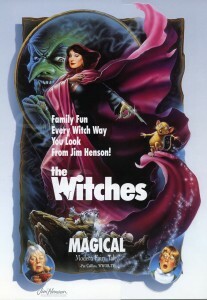 While the initial shooting schedule for The Witches, a feature film based on the Roald Dahl novel and executive produced by Jim, was relatively brief (the shoot began on April 12, 1988 and the first unit had completed their work by June 17th), the pre- and post-production periods stretched out in both directions. Negotiations with Dahl had begun more than two years before the shoot and with editing and testing of the film, it would be another two years after the shoot before the final version appeared in theaters in the US and UK. Jim was extraordinarily busy with other projects in the months leading up to the May 25, 1990 premiere, but he did get heavily involved with the promotion of the film. As the executive producer, he was instrumental in finding a balance between the director Nicolas Roeg’s vision and that of the author, Dahl. In addition, The Witches was a wonderful showcase for the work of Jim’s Creature Shop, so he was active in ensuring that the public was made of aware of those unique contributions. Jim spoke on camera about the Creature Shop, and the footage was edited into a featurette that was included in the electronic press kit and distributed to media outlets. Learn more about The Witches. Home video packaging for The Witches, 1990. This entry was posted in 06-June '88, 1988, Witches and tagged Creature Shop, Roald Dahl, Witches. Bookmark the permalink.